Dental implants are one of the most popular and successful options for replacing missing teeth. Dr. Brian Fong of Advanced Dentistry provides dental implant services to optimize patient health and give them long-term oral health solutions that are both durable and cosmetically appealing. 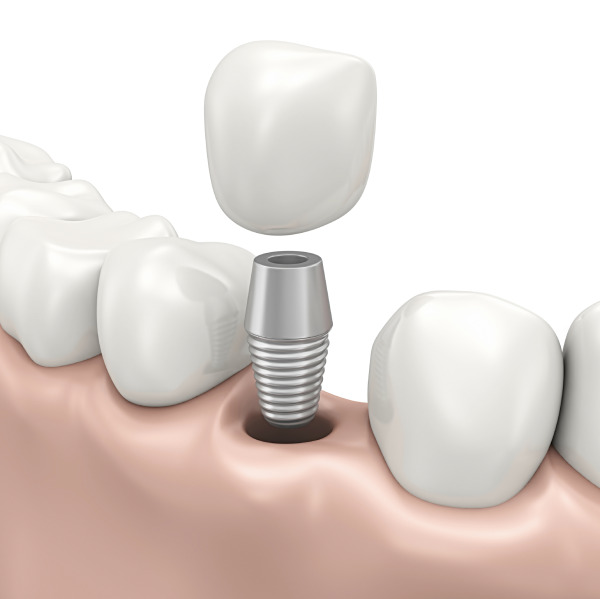 Implants are small titanium posts surgically embedded within the jawbone to mimic the tooth’s natural root. These implants provide a stable base for prosthetic crowns, dentures, and bridges. Dental implants can help address issues associated with damaged or missing teeth due to trauma, disease, and general wear. Dr. Fong only uses the highest quality products, Straumann implants, in his office to give patients results that are long-lasting and provide reliable dental function backed Straumann itself. Dr. Fong uses a high-tech local lab to create the restorations. With a reputation for artistic quality, this lab produces strong restorations that are not only durable but cosmetically appealing as well. When left alone, the gap created by a missing tooth or several teeth will eventually create additional problems. Bone degeneration – The implant is fused to the bone to stimulate and strengthen the jaw. Shift in tooth alignment– When gaps are left unfilled, surrounding teeth will shift in position towards the empty space. The implant will keep surrounding teeth in place. Early facial aging – Missing teeth will eventually create a sunken look and wrinkles around the mouth. Dental implants keep the integrity of the mouth intact. Eating and digestion problems – Missing teeth may limit a person’s diet or create digestion problems with hard to chew foods. This problem is non-existent with dental implants and patients will not have to worry about decay on the restorations! With a Periodontist who comes to the office to place the implants, Dr. Fong stays involved during each critical step of the implant process. Advanced Dentistry’s team of professionals work together to make the patient’s experience as seamless as possible with both placement and restoration. Dr. Fong’s education and experience with dental implants helps him create predictable results. Dr. Fong has high standards that carry over into the patient’s experience. His dedication to quality of service is prevalent throughout the office. The staff work as a team to educate patients about the dental implant process and are available to answer questions and address concerns. Advanced Dentistry’s Redwood office is equipped with the latest in high-tech equipment to enhance procedure accuracy. Dr. Fong’s passion to help people is transparent through patient care, investment in high-end technology and dedication to continuously educate himself, staff and patients. If you are interested in dental implants or wish to make an appointment, please contact our office today. We welcome patients from Redwood City and the surrounding area.